Spymaster James, Lord Kirkland, is in Bristol on business pertaining to his shipping company when he is struck with a bout of malaria that leaves him disoriented and unable to find his way back to the inn where he is a guest. In this vulnerable state, he is robbed and badly beaten. Two stevedores from the docks find him and carry him to the Herbert Infirmary, a clinic operated by a clergyman/physician and his sister. Daniel Herbert is on mission in Wales, but his sister praises the stevedores, who attend her brother’s chapel, for their Good-Samaritan deed and assures them that she can take care of the man whom she recognizes as an old friend of her brother. Laurel Herbert and her brother share a deep religious faith and the conviction that their faith requires active service to those in need. Shortly after Daniel completed his medical education, the two of them opened the clinic and a shelter for women and children in Bristol. The brother and sister are close friends not only because they work together but also because ten years ago when Laurel fled her husband’s presence and her parents refused to take her in, Daniel stood by Laurel. It was the allowance provided by her husband that funded Daniel’s medical training and allowed him and Laurel to open the clinic and the shelter. Laurel has not seen her estranged husband since she left him, but ten years is not long enough to prevent her from recognizing James when she gets a close look at her newest patient. Lauren and Kirkland met when Daniel brought his friend and schoolmate at Westerfield Academy and Oxford home with him. It was love at first sight, and eighteen-year-old Laurel and twenty-one-year-old Kirkland were married a few months later. All was bliss for a year, and then one evening Laurel walked into her husband’s study and saw a man about to attack James. She screamed a warning, and James turned to defend himself and broke the man’s neck. Horrified that her husband had not only killed a man but showed no remorse for doing so, Laurel saw him as some monstrous being she had never known. She left him, insisting that she never wanted to see him again. James took her at her word. Ten years have not diminished the sexual attraction between the two. When James, thinking she is part of his feverish dream, reaches for Laurel, she does not reject him. Unexpected consequences lead to their giving their marriage another try, but just as it seems as if they may find lasting happiness together, an attack on Laurel leads to events that threaten their new start. Can Laurel accept tones of gray in a world she has viewed strictly in black and white, or will she retreat to a life of selfless service where James is only a memory? 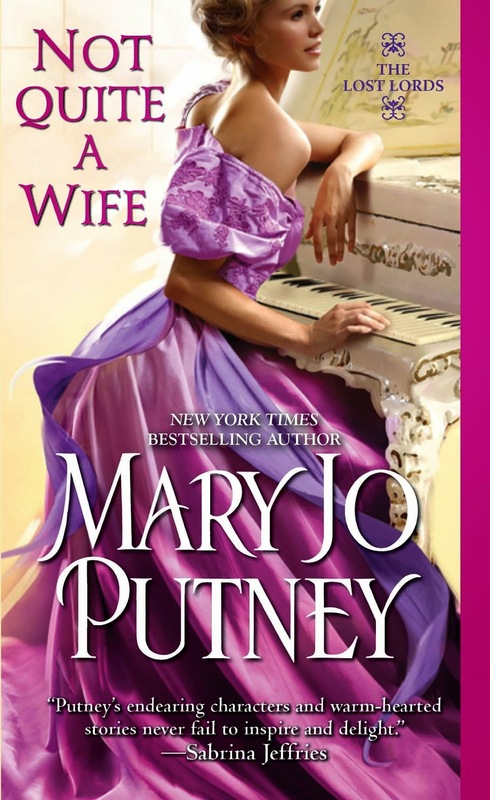 Not Quite a Wife is the sixth book in Putney’s Lost Lords series. Readers who have followed the series have been waiting for the story of Kirkland, the mysterious man who has pulled the strings in several of the lost lords’ adventures. Kirkland proves to have even more layers than I anticipated, and I loved discovering them. His love for Laurel and his love of music made him particularly interesting. He became one of my favorite heroes in this series. I was somewhat ambivalent about Laurel. One of the things that I appreciate most in Putney’s fiction is that she is unafraid to create characters who have bodies, minds, and spirits. In a genre that typically ignores the spiritual, Putney has long woven stories with characters who tackle issues of faith and belief, most notably in The Rake, Thunder and Roses, and Twist of Fate (the third book in her contemporary trilogy, retitled An Imperfect Process in a 2013 reissue). Daniel and Laurel are devout in the practice of their Christian faith, and although they are not Methodist, they work with the Methodists in providing social services to the poor. Laurel’s interpretation of “Thou shalt not kill” likely will seem extreme to some. I thought that given the time and Laurel’s youth, inexperience, religious convictions, and limited knowledge of her husband’s life, her reaction when she saw James kill a man was credible. But when a decade made little difference in her views, despite her years of contact with the grimmer realities of life, I was disappointed. But this was a relatively minor complaint and did not detract from my overall enjoyment of the book. I predict that this is going to be a book that readers either love or strongly dislike. Loving a Lost Lord and No Longer a Gentleman remain my favorites in this series, but I cast my vote with those who love this book. If you enjoy romances that move beyond the superficial, that include historically accurate social issues, that feature a daring rescue, I highly recommend this book. I think Not Quite a Wife can be read as a standalone, but Kirkland’s connection to the other lost lords and their spouses will not have the meaning for readers unfamiliar with the earlier books that it has for those who have read them. I expected Kirkland’s story to end the series, but I was delighted to read that MJP is now working on Daniel’s story, tentatively titled Not Always a Saint. Although Daniel is introduced in Not Quite a Wife, he is one of Agnes Westerfield’s lost boys. I eagerly await his book—my usual state when an MJP novel is involved. Thanks for the review, Janga. Mary Jo Putney has been a favorite of mine for years. Looking forward to this one! I am eager to know what you think, PJ. I've added it to my favorite marriage-in-trouble list. Looking forward to this one. I just re read Loving a Lost Lord too....I have a few faves of Mary Jo and this series is one of them. Hope, all of MJP's books are on my keeper shelves, but I agree that the Lost Lords series is special. I'm glad that we are getting at least one more book. Oh, this sounds like a series that I would enjoy - thanks for the review (another book for my extreme tbr list lol). I have the first four of this series in audio and gave them all 5 stars. I might just get the e-book of this one if I tire of waiting for the audio! MJP is one of the best, Q. If you have loved the others, I think you will really enjoy this one too. I have had this series on my Wish List for a while now. This one sounds like a good addition. I agree she should have grown in the ten years apart from her husband, but as is too often the case with zealous believers, no matter what the faith or cause, they tend to become a bit rigid, allowing the facts or reality of things get in the way of their beliefs. I am curious to see how MJP handles this. As usual, thank you for a thoughtful review.